NEW YORK - "Violin is hard, isn't it? We could do other things, but we like doing this." Ida Kavafian pointed out this simple truth in the middle of a wonderful master class she gave on Tuesday, the first day of the 2011 Starling-DeLay Symposium on Violin Studies at The Juilliard School. I arrived in sunny New York on Tuesday morning, after a red-eye flight from Los Angeles. Other participants, student artists and faculty came from 32 states and 14 countries -- nearly 200 violinists in all. We're in for a week of master classes with Kavafian, Itzhak Perlman, Glenn Dicterow, Joseph Lin and David Updegraff. We'll also go to specialized pedagogy classes on preparing students for concerti study, on music of Fritz Kreisler and Eugene Ysaye and on the physiology of playing, with pedagogy teachers Teri Einfeldt, Brian Lewis, Ray Iwazumi and Julie Lyonn Lieberman. It's five days to celebrate the violin and get everyone psyched to keep learning, keep teaching, keep playing. 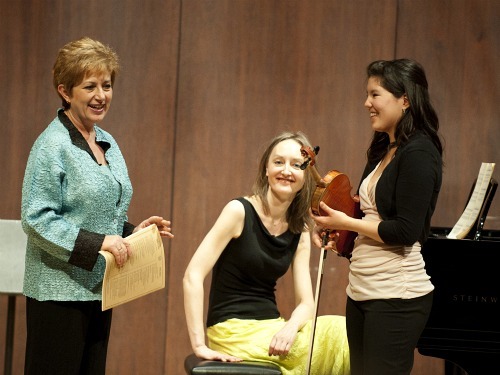 Today, after some mingling, we settled into Paul Hall for a master class with Ida Kavafian, violin faculty at the Curtis Institute and former violinist of the Beaux Arts Trio. Kavafian's a sharp teacher and a quick wit, going straight to the point yet with an engaging sense of humor that puts everyone at ease. Ida Kavafian, left, works with Rachell Wong, right. In the middle is pianist Pamela Viktoria Pyle. Photo by Nan Melville for The Juilliard School. Before describing what happened in the master class, I should mention that all the students mentioned played at an extremely high level for which they should be congratulated, and everyone here is grateful that they are putting themselves in front of this rather unusual audience of all violinists so that we can all learn more about teaching students at such high level! Rachell Wong, 19, of the Butler School of Music at the University of Texas, played first, with a well-prepared third movement of the Sibelius Concerto. Though the audience of violin teachers was whooping at the end of the impressively fast-played performance, Kavafian said to pianist Pamela Viktoria Pyle, "Good job -- chasing her!" "Right where it gets really difficult is where you take off like crazy," Ida said to Rachell. Though it's nice that Pamela can go for the ride, "110 people (in an orchestra) are not going to do the same thing." Kavafian pointed out that part of this movement's beauty is its stability, rhythmically. "If you check the metronome marking, it's not that fast," she pointed out, it's marked 88 to 92. Kavafian asked someone in the audience to retrieve her cell phone so that she could call up the metronome application and check the tempo -- we are truly in the 21st century! Indeed it was much slower, and Kavafian helped by stamping her foot, clapping, and snapping, to keep Rachell steady. "You probably have to hit even more notes than if you were rushing," Kavafian suggested. Taking Rachell's violin, Kavafian noticed the shoulder rest attached to the back of it, "I hate these things," she said. "A student came to Curtis without a shoulder rest once, and left with one. It was my greatest failure," she joked. "The problem with the shoulder rest is what it does to your bow," she said, pointing out that the violin is about an inch lower when there's no shoulder rest, and that changes bow mechanics. She had Rachell tune her octaves by gliding between them over the fingerboard, with the idea of loosening the fingers and getting rid of tension. "When you're shifting, you should not use any finger pressure -- keep your hand shape, but don't press so hard when shifting." Next, Ji-Eun Anna Lee, a sophomore at The Dalton School and a Juilliard Pre-College student, who plays an Amati on loan from the Stradivari Society, played the first movement of Schubert's Sonata in A Major, a very classical work requiring a good deal of interpretation. Before Anna played, Kavafian insisted that, even if she was playing from memory, she should have a stand with the music on it, unless she expected the pianist to play by memory. Sonatas are chamber works, collaborative works. Anna played with contrast and care, but Kavafian wanted her to mind the piano even more. "Be more inclusive of how your part works with the piano," she said. "Just because your part ends, doesn't mean the music ends. I would encourage you to imitate more the sound of the piano." For example, when the pianist must play the same note twice in a row, it is necessary to press the key again -- to re-articulate the note. This can be done on the violin as well, but it requires some planning so the notes don't meld together. Kavafian had Anna play without vibrato, to find expression in using just the bow. "Try to think about how to make music with your bow," Kavafian said. "Play it with your hand -- just not with vibrato." Then when adding vibrato, she encouraged her to consider, "how the string feels on the tip of your finger, so you're not just squeezing down, but you can feel the vibration of the string in the tip of your finger." In applying vibrato to the music, Kavafian requested more calm in the harmonically peaceful passages, with more vibrato when the music becomes harmonically agitated. Alicia Choi, a graduate of Juilliard Pre-College who has a Bachelor of Arts degree from Williams College, played the first movement of the Brahms concerto, with the very virtuosic Kreisler cadenza. Kavafian first drew attention to Alicia's bow thumb, which does not bend. "It's really hard to play with a straight thumb," Kavafian said. What happens is that you wind up producing the sound by pressing. "The thumb is important -- a straight thumb rarely gives you the pliability to play." Coax the sound out of the violin, work with it and not against it, she said. Kavafian also offered a lesser-known but effective bowing for the beginning of the Brahms Concerto, a trick her own teacher, Oscar Shumsky, taught her (go get your score, here it is): start down on the D, then up on the E, down on the F then sneak in another down G sharp, covering it with the string crossing, and proceed as it comes. She joked that a violinist should take a nice deep breath before starting the Brahms concerto and not exhale until some 46 measures later, that it requires that much tension in the beginning. When Alicia's violin began to get far sideways, Kavafian said, "Keep your work space in front of you!" bringing the violin back around. In talking about on place in the Brahms (m. 138) Kavafian said she didn't like going over to the A string for just one note, and having that inevitable change of color that comes with the change of string. "I think about things like that, my life is miserable," she joked. "So instead of going over to the A, I play out of tune!" Francisco Garcia-Fullana, who just earned his Bachelor's Degree from Juilliard, played the third movement of Brahms' Sonata in A. What a beautiful piece. Sigh. Kavafian talked again about imitating the piano in chamber music. "Imitating the piano, and playing very much with the piano, will solve many things," she said. For example, a common mistake is for the beginning of this movement to get too thick and heavy. It needs to be lighter, to show the slurs as the piano would. "It's most difficult to be simple at the beginning," said Kavafian. Another very effective thing that Kavafian did throughout the master classes was to direct students through gestures, like a conductor would -- a good conductor, that is! Her gestures were simple and effective, they gave direction. She said it was important to think about how to execute specific technical parts of the performance. For example, "there's nothing more important than the lead finger in a shift," she said, "don't go halfway there and stretch." It's important to make a plan. "Don't leave anything to chance," she said. Though some people might think that a focus on technical details might make a performance less musical, that is completely untrue. The focus on techniques is what frees the performer -- it even can make a performer less nervous. Doori Na, currently an undergraduate at Juilliard, played the first movement of the Sibelius Concerto. He tended to play with a lot of gesture, and Kavafian wanted him to tone it down. "I'm not saying you shouldn't play like that, just that you shouldn't play like that all the time," she said. "You can't have chocolate mousse for dinner. And for lunch and breakfast. With chocolate milk." In other words, if everything is played at a high level of intensity, then the really important moments don't seem as important -- everything just seems the same. "By the way, who is your teacher?" Kavafian asked. "Oh crap," Kavafian said, turning to the audience. "He's good." Kavafian wanted Doori to make the beginning of the Sibelius sound less scary, with less vibrato and more calm. He played it again, and when the intensity crept back in she stopped him on the stop, "The terror came! The Twilight Zone!" She pointed out that the Sibelius concerto is quite unique, "there's not another concerto that starts like this, it's just amazing." Later in the evening, violinist Ryu Goto, 22, gave a recital. Goto, who has played all around the world, a graduate of Juilliard Pre-College who graduated this year from Harvard with a degree in Physics. (You may have heard of his sister, Midori.) He played on the 1722 "Jupiter" Strad, on loan from the Nippon Music Foundation. 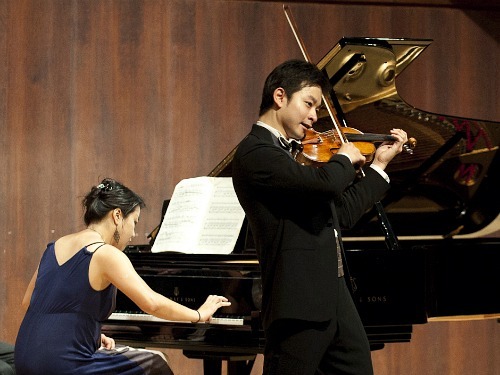 Violinist Ryu Goto and pianist Jiayi Shi. Photo by Nan Melville for The Juilliard School. He began the program with Prokofiev's Violin Sonata No. 1 in F minor, Op. 80, played with pianist Jiayi Shi. It was hard not to notice his unusual habit of looking directly at the audience, very frequently. What to make of it? It worked well when he was playing the wickedly difficult Introduction and Variations on "Nel core piu non mi sento," Op. 38 by Paganini. This piece for solo violin is full of humor contains more violin tricks than most of us fiddle players accomplish in a lifetime: crazy fast left-hand pizzicato; a bowed melody accompanied by left-hand pizzicato; flying down-bow staccato; flying up-bow staccato; right- and left-hand pizzicato both at the same time at breakneck speed; artificial harmonics in fast progression -- the list goes on. Ryu Goto had it all in hand, and his confidence, control and showmanship made it fun to be in the audience. His Brahms Sonata, played by memory, was gorgeous, but perhaps just a little too much "his." I longed for him to cultivate the same visual contact and connection with pianist Jiayi Shi that he was cultivating with the audience during this piece, for it is truly a collaborative work. The genius and complexity of the piano part puts it on equal footing with the violin part, and Shi's playing was both sensitive and complete. When he forgot to bring Shi out for an ovation after the Brahms, the omission was painful. He and Shi connected better in Ravel's Tzigane. During the solo beginning of the piece, Ryu milked the G-string for all it was worth. (Can I say that in polite company?) But truly, I've never heard those notes speak so well, so very high on our lowest violin string. He had so much control and such a high level of technique, it was fun to watch. He made moments of wonderful Gypsy frenzy, and when he took liberties, it really seemed improvised. The end was simply so fast -- what a thrill! I know the symposium is 5 day event, so this was day one. Out of that big handful of players to play, there were no excerpts? Why? Hopefully you'll see some more the coming days. If you get a chance, as some of the kids attending if they work on excerpts. I'm just curious to know. Laurie, thanks so much for all these details! For those of us who wish we were there, we can at least get a taste of what is going on through your blog. I just wish a lot of these classes, etc, were videotaped so we could possibly buy a copy and attend from afar. Good reporting, Laurie, thank you. Thanks, Laurie. I always love how the personalities of the master class teachers come through when you report on master classes. Thank you so for following the symposium Laurie! I'm especially connecting with the sans rest thing after having made a decision to try it before I actually read this. It is so true, an inch makes a difference! What a treat to be able to enjoy such young and tallented musicians but to experience their council points and glean something useful personaly! Reading these, is a highlight of a biennial. Thanks, Laurie!